Kyrat is pretty much every animal photographers dream (of those who know of the country, mostly). Going home without having shot the “big five” is, according to local myth, said to give bad luck. Honestly, this sound like just a marketing stunt to get people to visit this place, and to avoid bad luck, revisit, due to the inability to find any of them. I didn’t see any of them. But fret not, there’s more than enough to see and do without fairy-tale animals. One major behavioural difference between the animals here and everywhere else, is that all of them really aggressive. Even the pigs (it took my sandwich. Hyper aggressive move). Old archival footage shows these unprovoked attacks have been a problem for as long as cameras could record them. Their hostile nature may be why the Kyratis put them in cages for tourists to pet them. Kind of like a Zoo. A high, number one, tip-top recommendation would be not to pet them. It is safer not to. You will get great opportunities for some close-ups of eagles. They’re not shy. At all. If you come home without having had close contact with one, it’s weird. Disclaimer: In basically any other country, shooting any of these animals would be condoned. In Kyrat, on the other hand, the locals struggle with overpopulation of unnaturally reproductive animals, so fire away. If there is one species who will not go extinct anytime soon, it’s the canines (dogs, wolves etc.). Oh my, how the canines multiply. You can completely eradicate an entire area of them, and whaddya know, they’re back as soon as you’re over the hill. As you’ve seen in this article, the animal life of Kyrat can be as deadly as it is beautiful. Be careful out there. Hot tip: Eat raw meat. Eat like a badass survivor backpacker. 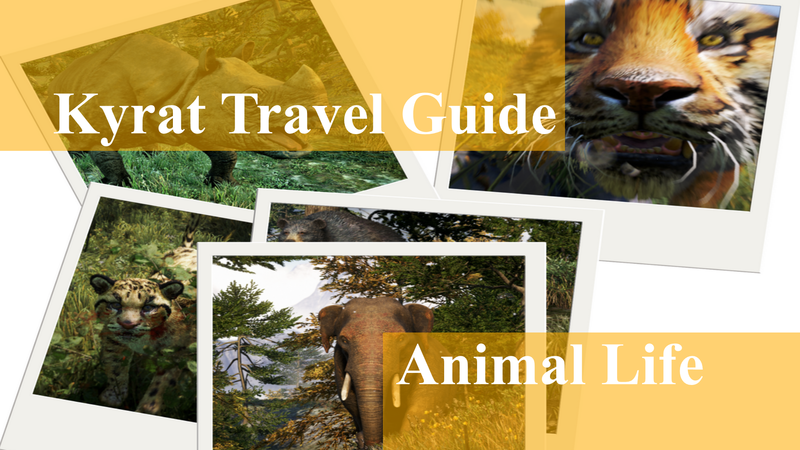 Somewhat related, if you ever get sick or injured by the fauna in Kyrat, be sure to have skimmed through the Kyrat Travel Guide: Medical Services. Bonus: Some Kyratis claim Yetis exist. It is repeated so much I thought I saw one myself. Got it on camera. It’s most likely just a huge, unproportionate, hairy guy. Bro this is pretty awesome haha. Keep up the good work.